If you are a first time trekker then Hampta Pass is the ideal chosen place. The unforgettable high moderate Himalyan adventure. It's situated at an altitude of 14000 feet (4250 meters). Hampta Pass trekking gives an amazing experience of exploring your life with special hues of nature. One gets an incredible view of rock faces, frosty valleys, thick pine forest, open meadows, adrenaline pumping waterway and pleasant as well as adventurous crossing areas. One of the most beautiful things about Hampta Pass Trek is its own valley of flowers. Funneled between two campsites of Chikha and Balu Ka Ghera, is a small yet scenic meadow of Jwara. This is a charming green meadow adorned with flowers in a spell binding varieties in full bloom. As you cross the multiple rivulets gurgling through these meadows, look out for yellow Marigolds sprouting around their ledges. Hampta pass trek connects two beautiful valley named; Kullu and Lahaul, were one get various Landscapes. Colorful Himalayan birds, species and flowers attract the viewers by their beauty. The scenic landscape, frequently change in weather and atmosphere delights the trekkers and gives a good option of clicking pictures. Climbing on the snow stretch and finding peace with nature with the surroundings of Himalaya. 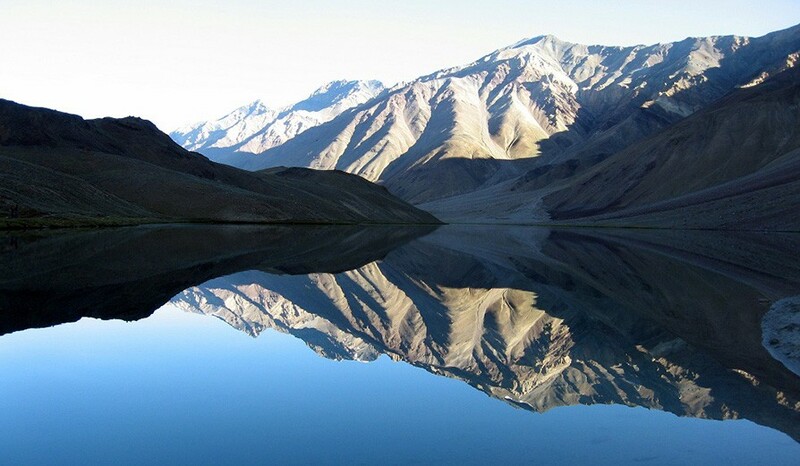 Chandra Tal is the famous Moon Lake in Lahaul and Spiti. Day 1 - Manali-Prini-Chikka - 6 hours. This trek starts from Prini village near Manali. This little village has been made famous by former Prime Minister Sh. Atal Bihari Vajpayee, who use to stay here in Holidays and has a house here. We start our trek along Hampta Nallah (Water Stream). It rises sharply over the left bank of the stream and takes us along a dense forest, and several river stream crossings before we reach a potato field and to a village. After another steep ascent from the village the path levels up and through a long walk in beautiful green pastures, we reach the magnificient camping site of Chikka. We can see the mighty Deo Tibba Peak rising high above infront of us as we camp here. Also nearby there is a very beautiful waterfall. We camp here tonight. We trek eight kilometers today to reach our next campside destination balu ka ghera. It's just below Hampta Pass and offers us a scenic view of glaciers and snow laden peaks. There's a lot of boulder hopping we will be doing today. In the way we will come across several beautiful alpine flowers and meadows as we walk along the river and occasionally get a chance for some adventurous crossings. Balu ka Ghera is layered with sand and dust bought down by the river. Hence the name "Balu" which means Sand. We camp here tonight beside the river enjoying the pristine views. Today it will be a steep ascent of 4-5 hours. The trail is along the river lined by yellow flowers. The climb is very steep and Tax you completely. However the top of the pass offers a grand panoramic view of the Snow Clad Pir Panjal Ranges and the Mighty Deo Tibba closeby. Descent on the other side is also very steep and tricky, we can either use an Ice Axe to climb down or sliding down can also be an option. After some Zigzag and a steep descent we come across a valley where Tall Snow Clad mountains will surround us from three sides and an open gulley leads us to our base camp to Sheagoru after a leveled but tiring walk. We camp here tonight beside the river side. Today the path will traverse along slippery soil, moraine and loose scree for some time till we reach flat grasslands. We walk here for some time along the nallah flowing from Indrasan Glacier. We have to cross glaciers and water streams a couple of times before we reach Chatru. From here we will see numerous water streams flowing nearby. We will camp alongside one of the stream. Chatru is a lovely camping site. We will get lovely views of the different mountain rages. The Chandra river flows in full swing right below. If roads are clear and weather conditions are ideal, we can proceed towards Chandra Tal or Moon Lake in Lahaul and Spiti. At an altitude of 4270 Meters approx., mostly surrounded with snow, this deep blue-water lake has a circumference of 2.5 Kilometers. It is the source of the violent Chandra River. Mountain ranges having snow capped peaks and snow slopes around the valley measures from 3000 Meters to 6500 Meters approximately. The name of the lake originates from its crescent shape. It's a beautiful camping site. We will proceed back towards Manali with a trip filled with much happines and memories. Click here to know more on whats included in your package and what to pack?